Dubai, UAE, April 10, 2019: Young Emirati racing star Rashid Al Dhaheri added another excellent result to a super race season at the 30th Andrea Margutti Trophy Event, as he finished third in the Mini Category for Parolin Racing Kart. The race was against some of the best racing talent in the world, with 45 drivers from 20 different nationalities in the 8-12 category. The racing weekend, over 4th-7th April at South Garda Karting in Lonato, saw consistent and strong performances from Rashid in qualifying, where he achieved first place in his qualifying group. On race day the sun shone, and Rashid overcame a difficult placing of second on the grid in the challenging outside position, with an outstanding performance as he quickly powered ahead to first place. With great dexterity and skill, Rashid accomplished excellent overtaking manoeuvres and powered ahead, creating a large gap between himself and the competition. During a highly competitive and close race, Rashid battled hard to push his advantage during the fast and furious ten-lap competition. Leading for most of the race, Rashid looked certain to achieve victory, however in the last two corners of the race, he faced impact from not one but two karts on both left and right, making it difficult to defend, with only a few metres left until the finish line, leaving Rashid completing the race in third following a thoroughly excellent performance throughout. The Andrea Margutti Trophy is one of the most important events in international karting, a race that continues its great success with the participation of all the main karting teams and strongest drivers. The first edition of the Andrea Margutti Trophy was held back in 1990, following the tragic passing of young rising karting star Andrea Margutti, who passed away at 14 years of age in an incident at the Trofeo delle Industrie in Parma. Since then, this event has been run in his memory. The result comes hot on the heels of a tremendous Championship win for Rashid in the WSK Super Master series. Here, the young star accomplished three wins out of four rounds of racing victories at the International Circuit Napoli Sarno circuit, the Circuito South Garda, Brescia, and Adria Karting Raceway, Adria - the first such achievement by any Mini driver for the past six years. He achieved 322 points for the tournament in total, which placed him 76 points clear of the nearest competitor. Rashid joined Parolin Racing Kart at the start of this season for World Series race participation including the WSK Karting series in Europe, Italian Championship and many others. 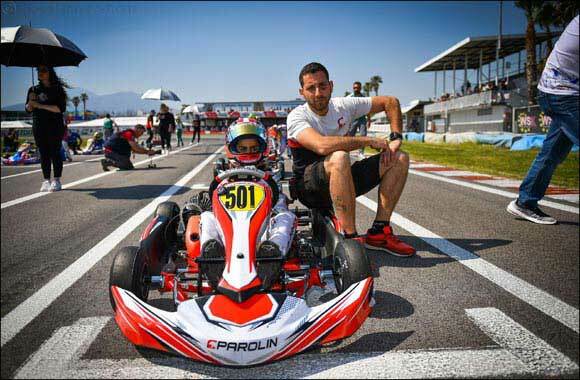 Parolin Racing Kart specialises in racing and rental karts, components, accessories and engines. Parolin's innovative spirit and creative approach in finding new technical solutions has helped it to widen a presence worldwide. The company is now known extensively as one of the most important and youngest kart manufacturers.